La Leva di Archimede (ENG): Vaccines: What's Under the Hood? Vaccines: What's Under the Hood? (IMCV) - Medical history books, almost uniformly extol the virtues of vaccination. Upon reading these books, one is left with the impression that during the 1800s and into the 1900s, there were rampant plagues that killed countless scores of people and that, because of vaccines, this is no longer the case. This is certainly what we believed growing up, and most people we talk to have a similar impression. It generally permeates society as an established fact. Paul Offit talks in his recent book "Deadly Choices--How the Anti-Vaccine Movement Threatens Us All" about how the whooping cough vaccine has reduced deaths from that disease from 7,000 to only 30. That paragraph set the tone for the rest of the article by indicating that thousands of people died each year from whooping cough, but after the DTP vaccine was introduced, very few died. Anyone who believed this statement would, of course, believe in the benefit of the vaccine. The article in the journal Pediatrics is quite damaging because it would have been read primarily by doctors, leaving many with the impression that vaccines were completely responsible for the decline in deaths. The actual number of deaths by the time of the introduction of the DTP vaccine was approximately 1,200--not the 5,000 to 10,000 often cited. Again, this faulty thinking that vaccines were responsible for the lion's share of mortality decline is pervasive in all corners of society. 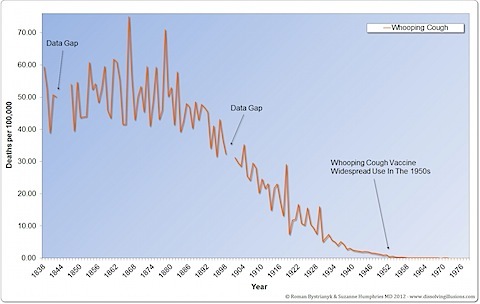 An additional important point to notice is that when looking at the graph you can clearly see that each year the trend was that of a decrease in deaths from whooping cough. At the point the vaccine was introduced there was no apparent effect in the downward trend. 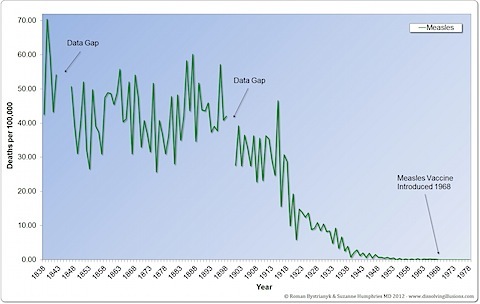 Another data set from England starting at the beginning of the 20th century shows the lack of impact of the vaccines even more dramatically. 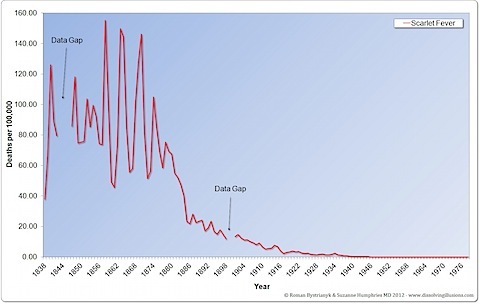 Here you can see that the death rate had fallen by over 98% before the national use of the DTP vaccine in the 1950s. England began keeping statistics in 1838, which was 62 years before official U.S. statistics were gathered. 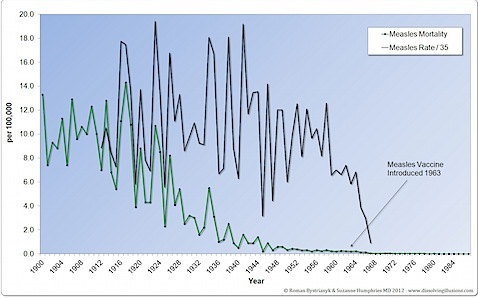 Looking at this data, we can see that the death rate from infectious diseases was high during the 1800s and declined from the mid-1800s to the mid-1900s to almost zero. 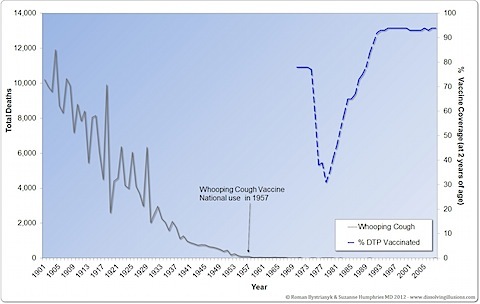 Looking at the whooping coughs death from England, deaths had decreased by more than 99 percent before any vaccine. In the case of measles, the death rate had declined by almost 100 percent. Analysis of the data shows this often-repeated mantra that vaccines were key in the decline of infectious disease deaths is a fallacy. Deaths had decreased by massive amounts before vaccinations. In the case of scarlet fever and other infectious diseases, deaths declined to near zero without any widespread vaccination. Unfortunately, this erroneous belief has led people to trust in vaccination as the sole way to handle infectious diseases when there were clearly other factors that caused mortality to decline. Those factors were improved hygiene, sanitation, nutrition, labor laws, electricity, chlorination, refrigeration, pasteurization, and many other facets that we now generally take for granted as part of modern life. Very little of the improvement in the death rate had anything to do with medicine. A 1977 report estimated that, at best, approximately 3 percent of the mortality decline from infectious disease could be attributed to modern medical care. The emphasis today on more and more vaccines, is in part built on this ingrained thinking. The fact that deaths from infectious diseases declined so greatly before vaccines and antibiotics, is ignored. This lapse in study has created a situation where we could have learned a better way to manage all infections in a more comprehensive way. Yet, to this day, despite such a phenomenal transformation, we have failed to learn the lessons of this history. The solutions that led to a 99 percent decline in death has been ignored, with the entire emphasis on the final 1 percent, which would have occurred anyway even without a vaccine. However, in some corners, there is recognition that vaccines were not what caused the major decline in infectious disease mortality. They often erroneously point to antibiotics and improved medical care and grudgingly give some credit to sanitation and other factors. There is little curiosity as to how all these factors worked and how they still apply today. The shift on emphasis is now on the incidence of disease after vaccination with a decreased emphasis on mortality. The thinking goes that, by wiping out the disease with vaccines, there is no risk of death. This appears to be a reasonable approach. How well has it worked? Let's take whooping cough as an example. In 1979 Sweden withdrew use of the DTP vaccine on the basis that it was not effective and possibly unsafe. The fear, of course, would be that with lower vaccination rates, the death rate would increase. So what happened in this case? In another case, DTP vaccination coverage in England dropped from about 78 percent to 30 or 40 percent because of concerns over safety. The assumption was that there would be an increase in deaths due to the decreased coverage. The years from 1976 to 1980 were the ones when vaccination rates were at their lowest. Using official statistics, the number of deaths in those years totaled 35. The deaths from the previous five years (1971 to 1975), while vaccination rates were higher, totaled 55, or about 1.5 times greater than when vaccination rates were lower. This was directly opposite what is generally believed should have happened. And have whooping cough rates really been controlled? 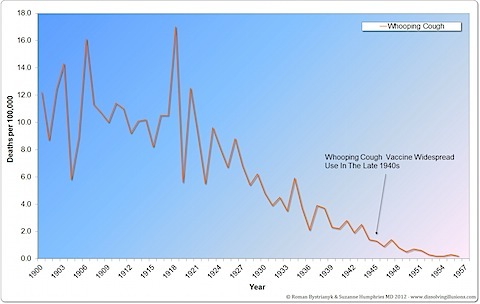 The sad truth is that whooping cough never really went away and is endemic. Huge numbers of people still cough from Bordetella pertussis, the bacteria involved in whooping cough. Because of waning vaccine- immunity, up to one-third of persistent coughs are whooping cough. Let's focus on another infectious disease--measles. Keep in mind that by 1963, almost no one died from measles. During this year, the whole of New England had only five deaths (Maine: 1, New Hampshire: 0, Vermont: 3, Massachusetts: 0, Rhode Island: 1, Connecticut: 0) that were attributed to measles. Deaths from asthma were actually 56 times greater than from measles during that year. But did incidence decline as vaccine proponents emphasize? There are some graphs you can find on the Internet that claim there was little decrease in incidence. The graph I have seen that shows this only has a few data points and a line between two distant points in time. This graph is of poor quality and draws an incorrect conclusion. Looking at more comprehensive incidence data, we can see a drop in incidence in 1963 at the introduction of the measles vaccine. Measles incidence did apparently dramatically drop after 1963. But can this drop be completely attributed to the success of the measles vaccine? The early measles vaccine that contained "killed" virus was an aluminum-precipitated vaccine produced from formaldehyde-inactivated monkey kidney cell cultures. A study from 1967 revealed that the vaccine could cause pneumonia as well as encephalopathy (inflammation of the brain). The killed vaccines were quickly abandoned. But there were also significant issues with the live vaccines, which were not highly attenuated and produced a "modified measles" rash in about half of those injected--essentially equivalent to a case of measles. Forty-eight percent of people had rash, and 83 percent had fevers up to 106°F post-injection. So how did measles incidence drop so dramatically after the 1963 vaccine? In part, it had to do with a definition. If you had a high fever and you had a vaccine, of course you didn't have measles even if you were sicker than you would have been if you contracted measles naturally. Back in the 1960s, it was expected that a single shot would protect you for life without serious effects, which would later turn out not to be true. Claims were even made in the 1960s that only a certain number of children needed to be vaccinated in order to wipe out measles. More than a decade later, the objective of measles elimination was still not achieved. There were repeat epidemics that happened throughout the United States. In the same year, after three types of measles vaccines had failed to produce eradication or even predictable herd immunity, vaccine scientists changed course from one shot and stated that, in using the new live vaccine, two doses would be required for reliable protection. They also recommended that everyone under the age of 32 be revaccinated because the old vaccines they received were inadequate. The single shot once promised to provide lifelong immunity against measles in the 1960s was never produced. And was the measles incidence declining before 1963 anyway? 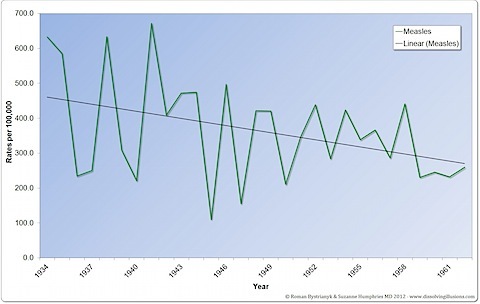 Looking at the measles incidence data, the trend line shows that incidence was on the decline. In fact, if that trend line held, measles incidence would have hit zero by around the year 2000. This is actually the year when the CDC declared measles had been eliminated from the United States. So were all these vaccines worth the cost, effort, and adverse reactions to tackle what was by 1963 considered a mild childhood illness? When we hear about vaccines, we are often told a simple story of how they stimulate antibodies. The theory goes that the stimulation of antibodies creates a memory of a disease so the next time you encounter it, your body will quickly defeat the enemy. It's a nice, simple, and easy-to-remember story. Believing you understand the immune system because you hear the words "antibodies" and "protection" mentioned together is like thinking you know how a car really works because you see it has wheels. The immune system is a highly complex, still-poorly understood entity, composed of many different cell lines, each producing different chemicals that are released into the blood. These chemicals are used by the body and are affected by age, stress, nutritional status, environment, and a whole host of factors that are barely understood. The immune system is traditionally divided into the humoral immune system that is involved with antibodies and the cellular immune system that does not involve antibodies but entails the activation of various cells such as natural killer cells. What we do know is that, contrary to popular belief, antibodies are not necessary when it comes to full measles recovery. Children with a deficit in antibody production, called agamma-globulinemia, recover from measles just as well as normal antibody producers, and this has been known since the late 1960s when vaccines were being developed and advanced. But antibody response is really the only thing that is talked about and promoted when it comes to vaccines. Because this knowledge disturbed the simplistic antibody-protection paradigm, it was considered a "disconcerting" discovery in this 1968 medical paper. How does nutrition play a role in disease? Discovered in the 1920s, vitamin A was dubbed the "anti-infective" vitamin. It alone has a tremendous impact on measles deaths. During the 1990s, mortality reductions of 60 to 90 percent were measured in poor countries using vitamin A in hospitalized measles cases. Availability of vitamin C-rich fruits and vegetables was another factor in disease morbidity and mortality reduction. There were improving trends in overall nutrition, as seen by a parallel in the decline in deaths from measles and the vitamin C deficiency disease, scurvy. Experiments done in the 1940s showed that vitamin C was effective against measles, especially when used in higher doses. In the early 1900s, other treatments were being successfully used to treat measles. In 1919 Dr. Drummond commented that cinnamon oil was an effective prophylactic against measles or that it made measles milder. Nutrition and other factors have a big impact on measles, so why aren't we talking about them at all? Because the emphasis is always on a single, highly lucrative medical procedure--vaccination. This sole paradigm has swept virtually all other strategies to the wayside. Another key factor to consider is that measles vaccine does not create lifelong immunity, whereas natural infection with measles does. The only way to remain immune with artificial immunity via vaccines is to be vaccinated several times during a lifetime. We have not yet seen how the vaccine will play out over several generations of exclusively vaccinated people. Epidemics are likely to become more common in the future. A 2009 study published in Proceedings of the Royal Society investigated what could happen with waning measles vaccine immunity even with high vaccine coverage among children. They predicted that, after a long disease-free period in the population, the introduction of infection will lead to far larger epidemics than predicted by standard models. A 1984 study  reported that by 2050, the proportion of measles susceptibles may be greater than in the pre-vaccine era. So have we created a ticking time bomb with waning immunity? Will there actually be bigger measles epidemics in the future? If there are, the response will probably be to blame the unvaccinated, which has in fact been done for over 100 years, and then to enforce more vaccinations upon different age groups. Because of the zealous pro-vaccine bias that permeates society, the true forces that drove the major decline in deaths from infectious diseases are not acknowledged. At most, there is a slight admission that "sanitation" has some effect, but better medical care and antibiotics are still given the credit. Groups of individuals who have anointed themselves as "skeptics" seek to derail anything that questions vaccination. The definition of skeptic used to be "one who instinctively or habitually doubts, questions, or disagrees with assertions or generally accepted conclusions," but this definition in its modern usage has been hijacked and transformed to someone that essentially blindly supports any orthodox position as gospel. These people will continue on their crusade of supporting vaccines at all costs and to assail anything that might question their myopic view. If those people had a desire to learn the truth, perhaps they would peek beneath the hood of infectious diseases and vaccines, and learn a little more. Imagine what could be in the trunk! Suzanne Humphries and Roman Bystrianyk are authors of Dissolving Illusions: Disease, Vaccines and the Forgotten History available on Amazon. 1. Irwin W. Sherman, Twelve Diseases That Changed Our World, 2007, p. 66. 2. Paul A. Offit, MD, Deadly Choices--How the Anti-Vaccine Movement Threatens Us All, 2011, p. xii. 3. James D. Cherry, MD MSc; Philip A. Brunell, MD; Gerald S. Golden, MD; and David T. Karzon, MD, "Report on the Task Force on Pertussis and Pertussis Immunization--1988," Pediatrics, June 1988, vol. 81, no. 6, Part 2, p. 939. 4. Historical Statistics of the United States Colonial Times to 1970 Part 1, Bureau of the Census, 1975, pp. 77. 5. John B. McKinlay and Sonja M. McKinlay, "The Questionable Contribution of Medical Measures to the Decline of Mortality in the United States in the Twentieth Century," The Milbank Memorial Fund Quarterly, Health and Society, vol. 55, no. 3, summer 1977, p. 425. 6. Letter from Victoria Romanus, MD, PhD, Department of Epidemiology Swedish Institute of Infectious Disease Control, Stockholm Sweden, August 25, 1995. 7. Record of Mortality in England and Wales for 95 Years as Provided by the Office of National Statistics, 1997; Health Protection Agency Table: Notification of Deaths, England and Wales, 1970-2008. 8. Edward Rothstein, MD, and Kathryn Edwards, MD, "Health Burden of Pertussis in Adolescents and Adults," Pediatric Infectious Disease Journal, vol. 24, no. 5, May 2005, p. S44. 9. Vital Statistics of the United States 1963, Vol. II--Mortality, Part A, pp. 1-18, 1-19, 1-21. 10. Vincent A. Fulginiti, MD; Jerry J. Eller, MD; Allan W. Downie, MD; and C. Henry Kempe, MD, "Altered Reactivity to Measles Virus: Atypical Measles in Children Previously Immunized with Inactivated Measles Virus Vaccines," Journal of the American Medical Association, vol. 202, no. 12, December 18, 1967, p. 1080. 11. "Measles Vaccine Effective in Test--Injections with Live Virus Protect 100 Per Cent of Children in Epidemics," New York Times, September 14, 1961. 12. "Thaler to Hold State Senate Hearing to Find Fastest Way to Expedite Plan," New York Times, February 24, 1965. 13. Jane E. Brody, "Measles Will Be Nearly Ended by '67, U.S. Health Aides Say," New York Times, May 24, 1966. 14. Lisa Belkin, "Measles, Not Yet a Thing of the Past, Reveals the Limits of an Old Vaccine," New York Times, February 25, 1989. 15. B. Goldman, "The Bodyguard: Tapping the Immune System's Secrets," Stanford Medicine, summer 2011. 16. P. J. Lachmann, "Immunopathology of Measles," Proceedings Royal Society of Medicine, vol. 67, November 1974, p. 1120. 17. "Measles as an Index of Immunological Function," The Lancet, September 14, 1968, p. 611. 18. Wafaie W. Fawzi, MD; Thomas C. Chalmers, MD; M. Guillermo Herrera, MD; and Frederick Mosteller, PhD, "Vitamin A Supplementation and Child Mortality: A Meta-Analysis," Journal of the American Medical Association, February 17, 1993, p. 901. 19. Fred R. Klenner, MD, "The Treatment of Poliomyelitis and Other Virus Diseases with Vitamin C," Southern Medicine & Surgery, July 1949. 20. "Cinnamon as a Preventive of Measles," American Druggist Pharmaceutical Record, New York, November 1919, p. 47. 21.J. M. Heffernan and M. J. Keeling, "Implications of Vaccination and Waning Immunity," Proceedings of the Royal Society B, vol. 276, 2009. 22. D. L. Levy, "The Future of Measles in Highly Immunized Populations: A Modeling Approach," American Journal of Epidemiology, vol. 120, no. 1, July 1984, pp. 39-48.